Stem cells therapy are emerging as an important therapeutic option in the field of cartilage regeneration. Rapid development of stem cell-based therapy for cartilage regeneration in the recent past has been witnessed across the world. Stem cells are mainly classified in three kinds of cells: hematopoietic stem cell, mesenchymal stem cells, and pluripotent stem cells. The global stem cell cartilage regeneration market size was valued at US$ 254.4 million in 2017, and is expected to witness a CAGR of 8.9% over the forecast period (2018 – 2026). Stem cell therapy for knees, minimally invasive procedure, has the potential to decrease inflammation, halt progression of arthritic damage, repair joint cartilage, and delay or avoid knee replacement surgery. Injection of progenitor cells, especially mesenchymal stem cells (MSCs), has been found to be an effective and better solution for repairing degenerative cartilage compared to implantation of differentiated cells such as articular cartilage. In addition to this, other potential benefits such as lower risk and shorter duration of minimally invasive surgery procedures are expected to fuel demand for stem cell therapy for cartilage regeneration during the forecast period. For instance, according to NCBI 2016 report, a minimally invasive procedure to harvest stem cells from both fat and bone marrow and inject the concentrated cells under image guidance can be performed in 2-3 hours. Stem cell therapy for cartilage damage is associated with high treatment costs. According to the Journal of Cell Science & Therapy 2017 article, stem cell therapy range from US$ 5,000 to US$ 8,000 per treatment. In the U.S., the one-time treatment, which utilizes blood drawn from a patient can cost as little as US$ 1,500. However, additional protocols that utilize a bone marrow or adipose tissue extraction for stem cells can cost as much as US$ 15,000 to US$ 30,000. Moreover, the bone marrow extraction is an invasive procedure, which requires bone penetration and adipose tissue extraction, necessitates a medical professional trained in liposuction. These challenges are expected to hamper the adoption of stem cell in cartilage regeneration, during the forecast period. 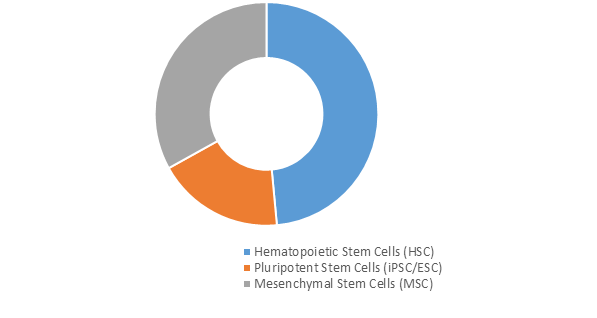 On the basis of region, the global stem cell cartilage regeneration market is segmented into North America, Latin America, Europe, Asia Pacific, Middle East, and Africa. North America is expected to be the most conducive region for growth of the stem cell cartilage regeneration market over the forecast period, due to high presence of key players in the region. Key players such as Vericel Corporation, Osiris Therapeutics, among others are focusing on various growth strategies such as gaining regulatory product approvals and launching innovative stem cell based cartilage regeneration products and technologies in the market. Furthermore, increasing geriatric population, which is more prone to degenerative disorders such as osteoarthritis among the U.S. population, is further expected to propel growth of the stem cell cartilage regeneration market. For instance, according to Centers for Disease Control and Prevention (CDC), July 2018 data findings, from 2013-2015, an estimated 54.4 million U.S. adults (22.7% of total U.S. population) annually suffers from some form of arthritis, rheumatoid arthritis, gout, lupus, or fibromyalgia. Asia Pacific stem cell cartilage regeneration market revenue is expected to significantly grow over the forecast period. In India, stem cell based cartilage regeneration procedures are conducted by various hospital and clinics. Hospitals such as Apollo, TOSH (Trauma & Orthopaedic Speciality Hospital), among others are conducting stem cell-based knee arthritis surgery procedures. Key players operating in the global stem cell cartilage regeneration market include Theracell Advanced Biotechnology Ltd., Orthocell Ltd., Xintela AB, CellGenix GmbH, Merck KGaA, Osiris Therapeutics, Inc., BioTissue SA, and Vericel Corporation.